At Station Square Dental, we go above and beyond to provide you with the latest in dental technologies, as well as the widest range of oral health care services. This is why our highly trained staff specialise in all facets of dentistry, including general, cosmetic, orthodontic, and specialised dentistry. In our practice, you’ll find all of the common dental treatments your family rely on, including check-up and hygiene exams, dental fillings, and teeth whitening. On top of this, you’ll also have access to niche services that are hard to find elsewhere, including Inman Aligners, dental implants, periodontal care, and more. This makes Station Square Dental your one-stop family clinic. General Dentistry – Dental exams, teeth cleaning, children’s dentistry, dental implants, emergency dental help, broken or fractured teeth, root canals, tooth extractions, wisdom tooth extractions, periodontal gum care, dentures and dental anxiety. Cosmetic Dentistry – Teeth whitening, dental crowns, dental bridges, porcelain veneers and CEREC technology. Orthodontics—Braces, ClearCorrect, Inman Aligner and Invisalign. Specialised Dentistry–Sports Dentistry , Snoring and sleep apnoea, and teeth grinding. Our philosophy is to provide our patients with the highest level of dental care using the latest technology. 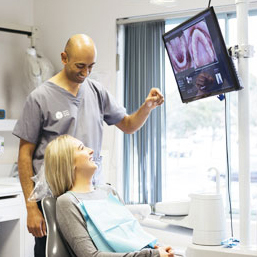 Just one of our latest advancements in equipment includes our CEREC machine, a revolutionary system that enables our dentist to design, fabricate and fit a new crown, veneer, onlay or inlay in a single visit. Advanced dental technology doesn’t just allow us to produce superior results for our patients, but it also helps them to have a more comfortable and stress-free experience. Instead of using messy dental putty to take an impression of your tooth, we can now obtain a digital image using the machine’s special camera, helping to streamline the process. To experience our exceptional dental services for yourself, please contact Station Square Dental today!